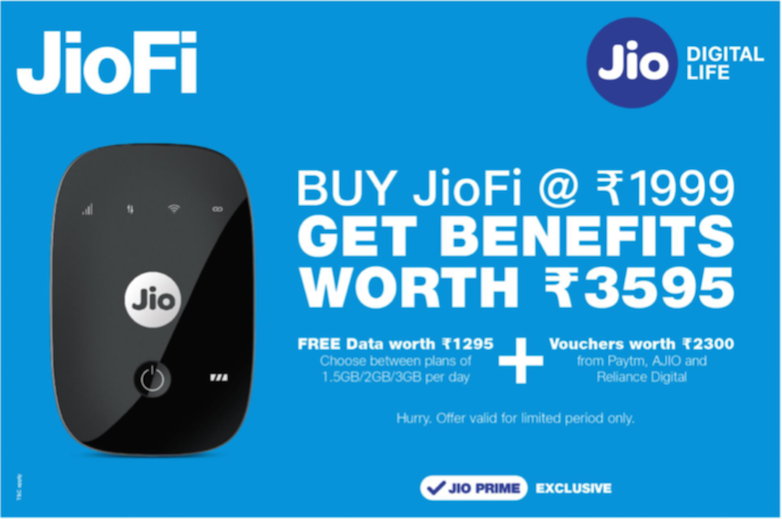 Jio Launches New Offer On The JioFi 4G Hotspot! Buyers will get total benefits worth Rs 3,595/- on buying the JioFi hotspot at the new price of Rs 1,999/-. As a part of the new offer, Reliance Jio will now offer free benefits worth Rs 3,595/- with its JioFi device. The company has bundled free data and vouchers for its JioFi 4G hotspot. Under the new offer, the JioFi 4G hotspot device will be available at Rs 1,999/-. Jio is offering bundled data worth up to Rs 1,295/- and vouchers worth Rs 2,300/- from AJIO, Reliance Digital, and Paytm. For other customers who do not want to opt for the new JioFi offer, the JioFi device will still be available at Rs. 999, the price Jio has been selling it for since September 2017. 1 New JioFi Offer – How To Redeem Free Data? New JioFi Offer – How To Redeem Free Data? Under the new offer, customers who buy the JioFi hotspot device at Rs 1,999/- will get free 4G high-speed data worth Rs 1,295/-. Customers will get to choose between plans with daily data allocation of 1.5GB, 2GB and 3GB. Jio is also offering vouchers of Paytm, AJIO and Reliance Digital offers, which together will be worth Rs 2,300/-. Jio is offering 1.5GB of 4G data per day for next eight recharge cycles (total 8 months). Jio is offering 2GB of 4G data per day for the next six recharge cycles (total seven months). The company will offer 3GB of 4G data per day for the next four recharge cycles (total five months). Reliance Jio is offering free shopping vouchers worth Rs 2,300/- from Paytm, AJIO and Reliance Digital. Customers will get cashback vouchers worth Rs 800/- from Paytm, which can be used for booking two flight tickets. Plus, Jio will also offer flat Rs. 500 off on apparels on a minimum purchase of Rs 1,500 on AJIO. And last but not the least, the company is offering a free voucher worth Rs 1,000/- applicable on any purchase at a Reliance Digital outlet. Customers will get the coupons in the JioFi account on MyJio app. Apart from free 336GB data and shopping vouchers, customers will receive a free Jio Prime membership worth Rs 99/-. The offer is valid on purchase of a JioFi 4G Hotspot router priced at Rs 1,999/- through a partner retail store, MyJio app or Jio’s official website. On the occasion of Holi, Reliance Jio has extended its ongoing ‘More Than 100% Cashback’ offer till March 15. 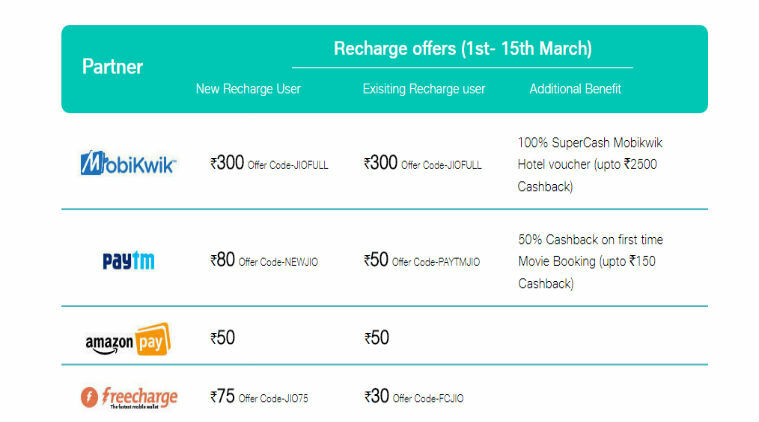 Under the new offer, users will get a cashback of up to Rs 700/- on any recharge of Rs 398/- and above. The ‘More Than 100% Cashback’ offer is exclusive to Jio Prime members only, and now will be valid from March 1 to March 15. Reliance Jio is offering 100 percent cashback vouchers worth Rs 400/- in the form of eight vouchers of Rs 50/-, which will be credited to the MyJio app account. The vouchers can be redeemed one at a time on any recharge of Rs 300/- and above. On the other hand, customers will also get additional Rs 300/- cashback on select digital wallets. Jio users can recharge with JioMoney, Paytm, FreeCharge, Amazon Pay, PhonePe and MobiKwik to get the extra cashback. Amazon Pay users will get Rs 50/- cashback. New Paytm users will get Rs 80/- cashback while existing users will get Rs 50/- as cashback. Additionally, Paytm is also offering a 50 percent cashback, up to Rs. 150, on first-time movie booking with Jio recharge. MobiKwik users will get cashback of Rs 300/- and 100 percent SuperCash MobiKwik hotel voucher worth up to Rs 2,500/-. PhonePe new users will get a cashback worth Rs 90/- while existing users will get Rs 60/- as cashback. FreeCharge new users will get Rs 75/- cashback while existing users will get Rs 30/- cashback. "Jio Launches New Offer On JioFi Hotspot; Extends 'More Than 100% Cashback' Offer! ", 5 out of 5 based on 2 ratings.